Espesye sa isda nga una nga gihulagway ni Linnaeus ni adtong 1758 ang Scophthalmus maximus. Ang Scophthalmus maximus sakop sa kahenera nga Scophthalmus sa kabanay nga Scophthalmidae. Pagka karon wala pay siak nga nalista ubos niini niya. ↑ 1.0 1.1 1.2 1.3 1.4 1.5 Nielsen, J.G. (1986) Scophthalmidae., p. 1287-1293. In P.J.P. Whitehead, M.-L. Bauchot, J.-C. Hureau, J. Nielsen and E. Tortonese (eds.) Fishes of the North-eastern Atlantic and the Mediterranean. UNESCO, Paris. Vol. 3. ↑ 3.0 3.1 3.2 3.3 Eschmeyer, W.N. (ed.) (2000) Catalog of fishes. Updated database version of February 2000., Catalog databases as made available on the Internet at Feb. 20, 2000. 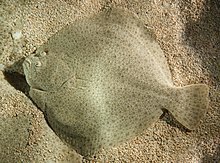 ↑ 4.0 4.1 4.2 Bailly, N. and B. Chanet (2010) Scophthalmus Rafinesque, 1810: The valid generic name for the turbot, S. maximus (Linnaeus, 1758) [Pleuronectiformes: Scophthalmidae]., Cybium 34 (3):257-261. ↑ Quignard, J.-P. and J.A. Tomasini (2000) Mediterranean fish biodiversity., Biol. Mar. Mediterr. 7(3):1-66. Kining maong panid kataposang giusab niadtong 6 Disyembre 2017 sa 15:57.